The year 2001 was the centenary of the opening of London's first electric tramways. After the L.U.T. and East Ham, Croydon became the third area to begin operating these new vehicles. Our postcard, serial number 5643 by Blum & Degen, shows car number 2 in George Street, Croydon. This copy was posted on 6th April 1908 to an address in Brussels, but by the "Providence" lifeguards on the tram we can accurately date the photograph to the first three months of 1902. Standard gauge horse tramways had been operated in Croydon by the Croydon Tramways Company since 1879 but the Corporation, keen for expansion and electrification, had taken over the company on 22nd January 1900 and leased the operation to the British Electric Traction Group, using the British Thomson-Houston company to rebuild and electrify the system. The first electric tram ran in service on 26th September 1901 between Norbury Station and Purley. 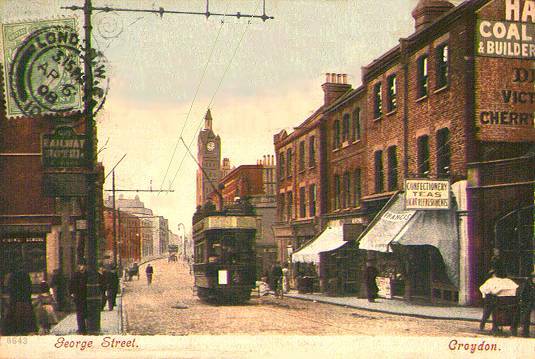 The route through George Street to Addiscombe opened on 4th January 1902. Car number 2 in our view was one of the initial batch of 35 cars built in 1901 by G.F.Milnes at Hadley in Shropshire. They had B.T-H type B18 controllers and 6ft wheelbase trucks each with two General Electric type GE52 27 horse power motors. Nineteen cars were on Brill 21E trucks and sixteen were on Peckham No. 9 Cantilever Extension trucks. Car 2 was one of those with a Peckham truck. At first the cars were fitted with "Providence" spring lifeguards made by the Dover Safety Car Fender Co., but these were rejected by Major Pringle, the Board of Trade inspector, during his visit on 7th March 1902 and were soon replaced by Wilson and Bennett wire mesh guards and in later years by Tidswell wooden slatted ones. These trams were withdrawn in 1927. The Croydon livery was Munich lake and ivory until 1928 when port wine and grey was used on new bogie trams. The "Cantilever Extension" four wheel tramcar truck was designed in the United States by Edgar Peckham in 1891. They were built in Kingston, New York, and were widely used in the States. In 1897 the design was patented in the UK and around the turn of the century a large number of trucks were imported into Europe. The cantilever truck system is based around hornway pedestals cast in malleableized soft steel. Bars forming upper and lower side members made of soft steel are fixed to these by means of power driven hot rivets. They are located into recesses so that the strains are carried directly to the hornways and not via the rivets. The top part of each hornway has a pocket containing coil springs to support the axlebox. The bottom of the hornways, below the axleboxes, are connected by a malleable section known as the "repairing piece" which is removable to allow withdrawal of the wheels and axles for servicing. The upper side member is fitted with a combination of coil and elliptical springs to carry the car body. The sections of the lower side member join the bottoms of the hornways to each other and to the outside ends of the upper side member to form a continuous cantilever truss, thus strengthening and supporting the truck ends and by extending the spring base, enabled longer car bodies to be used. Using standard hornway castings and various length side member bars the truck can be made up to any size wheelbase and with a wide variety of spring combinations. There were a number of standard products, but the trucks could be made up to the customers' specifications. The "Standard No 8" was for closed car bodies of 18 to 20 feet in length. The "Excelsior No 7" was for smaller cars of 14 to 16 feet. The "Extra Long No 9" was for cars over 20 feet. There was a heavier version, the "Metropolitan Special No 10" which was for higher speed cars. The No 14 was a bogie truck. Suffix letters designated the spring variants. Sadly with age parts began to work loose and maintenance was high. A war of words in the technical press developed between Edgar Peckham and John Brill as to who's was the best product, Brill rather unkindly describing the Cantilever as a "patch-work truck". From 1st June 1906 Croydon Corporation took over the operation of the tramway themselves. On 28th March 1927 the route through George Street closed, being replaced by buses of the London General Omnibus Co. but the remainder of the tramway and trams passed to London Transport on 1st July 1933. The last tram ran in Croydon on 7th April 1951 although the 23 surviving ex-Croydon Corporation bogie trams were transferred and worked on routes from New Cross Depot, some until 5th January 1952. The story does not end here though. With the opening of Tramlink on 10th May 2000, trams are now back in George Street, Croydon.